Translucent carbon dioxide ice covers the polar regions of Mars from each season. It is warmed and sublimates (evaporates) from below, and escaping gas carves a numerous channel morphologies. 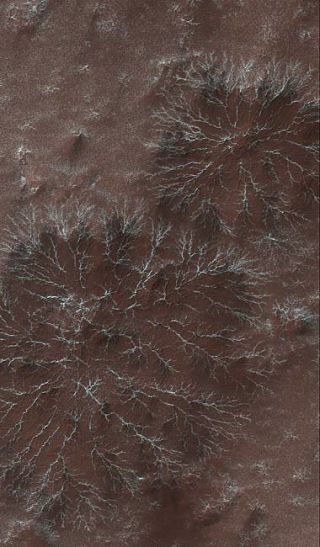 SANFRANCISCO—NASA scientists have discovered what might form some of the weirdestlandscapes on Mars, winding channels carved into the Martian surface thatscientists have dubbed ?spiders,? ?lace? and ?lizard skin.? The unusuallandscape features form in an area of Mars? south pole called cryptic terrainbecause it once defied explanation. But newobservations from NASA?s Mars Reconnaissance Orbiter, presented here today at ameeting of the American Geophysical Union, bolster theories that the intricatepatterns may be sculpted by springtime outburstsof carbon dioxide gas from underneath the frozen-carbon dioxide polar icecap. Mars, likeEarth, has seasons that shift as the planet orbits the sun. During the southernhemisphere winter, some of the carbon dioxide in the planet?s atmospherefreezes to form a translucentice cap made of the gas. Comespring, the sun?s rays penetrate this layer of ice and begin to warm the red-rocksurface underneath. ?The sunpasses through the ice and warms up the surface because the surface is dark andabsorbs the sunlight,? explained mission scientists Candice Hansen of NASA?sJet Propulsion Laboratory in Pasadena, Calif. The warmsurface then heats the ice layer from the bottom up, causing carbon dioxide gasto sublimate (like dry ice fumes used to imitate fog at a haunted house) fromit and gather underneath the ice. As the gasaccumulates and its pressure increases, it seeks out weak spots in the ice andbursts forth, spewing carbon dioxide gas back into the Martian atmosphere. Thegas carries some of the dustfrom the surface along with it, which then settles into ?fans? on top ofthe ice. ?It?s aprocess unlike anything we have on Earth,? Hansen said. As thesurface material is carried out by the rushing gas, channels are carved intothe surface that form intricate patterns. Some, which scientists have dubbed?spiders,? have spindly channels that radiate outward from a center point.Hansen describes other patterns as appearing like lace or scaly lizard skin. Just whatcauses these different shapes is a mystery. It could be different features ofthe underlying landscape or differences in the way the gas moves under the ice,but one thing is for sure Hansen said, ?there?s something that causes thedifferent morphologies.? Fields offans of surface material are scattered on top of the ice that overlies thechannel features, increasing as the spring wears on and the sun beats down moreintensely. Eventually, as summer approaches, all the ice evaporates away,leaving only the intricate scars on the Martian surface.